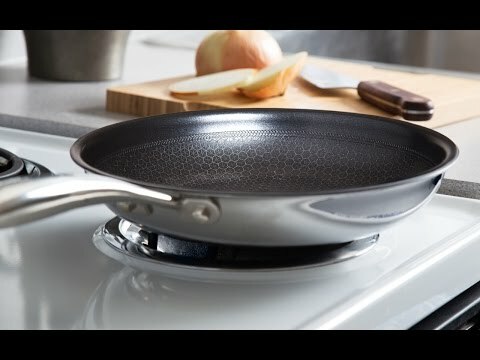 Black Cube frying pans are where stainless steel and non-stick cookware meet. A raised steel pattern allows food to brown, while recessed Teflon stays safe from metal utensils and keeps things from sticking. 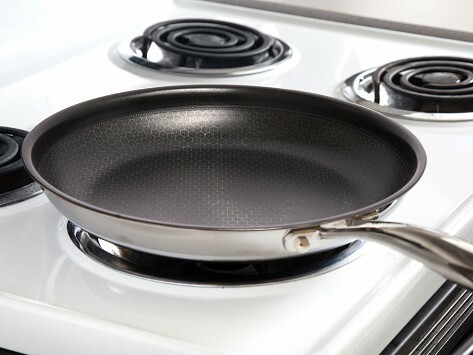 PFOA-free, these pans are safe in the oven and dishwasher and are scratch-resistant, too. Dimensions: 8" Fry Pan: 16" x 8" x 2"; 9 1/2" Fry Pan: 18" x 9.5" x 3"; 11" Fry Pan: 19.5" x 11" x 3.5"
Weights: 8" Fry Pan: 1.35 lbs. ; 9 1/2" Fry Pan: 1.8 lbs. ; 11" Fry Pan: 2.3 lbs. I ordered the small pan and decided to plunk the $ for the larger pan. I liked the eco friendly way the inventors designed the pan and that I could use metal utensils. I use this pan over and over. It’s indestructible and cleans so easily. It will last forever! Handles the temperatures - cleans up quickly - can use metal tools without damaging the surface. I was thinking I might look for a smaller one.